Attach Fingerprint file for front. 1 MB max upload. (Larger files please email to service@kinandpebble.com include order number). Attach Footprints file. 1 MB max upload. (Larger files please email to service@kinandpebble.com include order number). 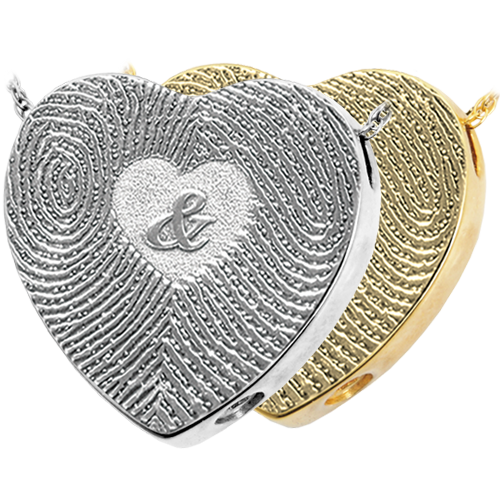 Capture a precious moment like the birth of a newborn with this sweet baby remembrance charm. 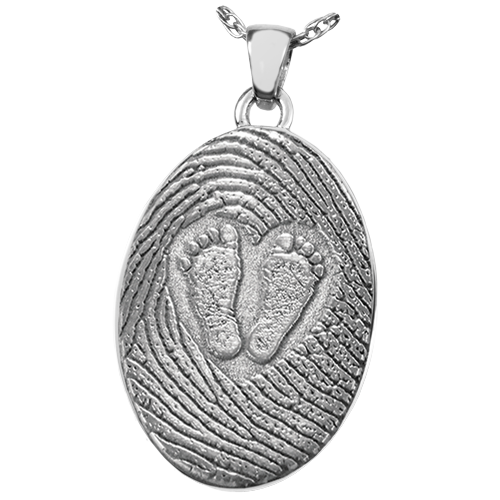 Baby foot-prints are engraved inside a heart where the background has been etched away so that the baby feet are raised and the heart is recessed creating a three dimensional effect. 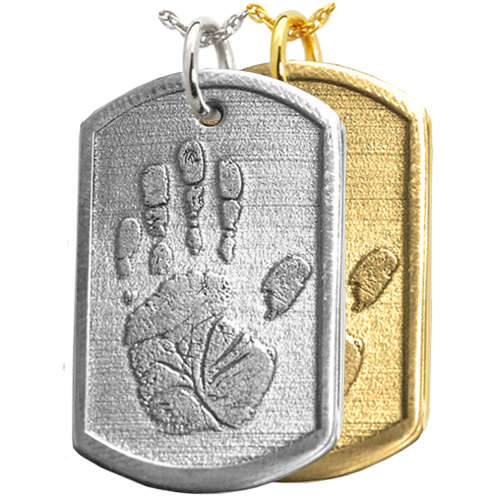 The mother's fingerprint is engraved as the background to the babyfeet symbolizing a loving and nurturing bond. This pendant may be worn as a necklace, added to a charm bracelet or key fob. How do I Collect prints? You may use a print from a birth certificate or art project. Or you may simply use any ink pad and plain white paper. Black ink works best. Lightly touch the inked surface twice and then press downward on the paper. Use more of a tapping motion than a rolling one. Take a digital photo of each of the best prints (highest resolution when 1 print fills frame without cutting it off). If you need to scan your print- lay print flat against scanner glass (you may need to apply gentle pressure to scanner lid) scan at 600 dpi and save in JPG format. Please review your prints, if hand-prints look blurry at 100% on screen, you will probably need to adjust your settings. If your file is 1 MB or less, use the File Upload feature. For files larger than 1 MB, place your order, then submit your high resolution digital file in JPG format to service@kinandpebble.com with order number.